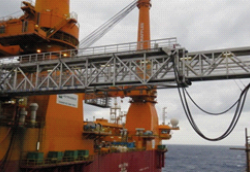 OOS International performed an excellent operation replacing the former gangway on OOS Gretha deep offshore using her own cranes. After cutting the pedestal a new gangway of the well-known brand Marine Aluminium was installed. To fulfil the needs of the client Petrobras a spool piece of 3 meters has been created as well to have a better range in height of the gangway. In three weeks’ time the project was completed successfully as planned and within the budget. The Marine Aluminium gangway will be one of the most significant characteristics of OOS Gretha working alongside Petrobras’ oil platform. OOS Gretha is an accommodation crane vessel, DP3, with a hotel capacity of 618 persons on board and 2 x 1800 ton cranes, which can also be used in tandem lifting up to 3600 MT.